Special 5-1 is the first level of Special 5 in Super Mario 3D Land. It is based off World 2-4. 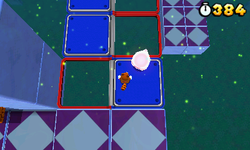 The player starts out on a set of platforms that lead to a set of Reversible Platforms with several Boos on them, at the end of the set of Reversible Platforms the player must drop down and go onto the next set of Reversible Platforms that leads to the Warp Box. In the next area is the Checkpoint Flag and another set of platforms that lead to more Reversible Platforms which have Spiked Balls launched onto them. After this is another set of Reversible Platforms that lead to some elongated Reversible Platforms. After the elongated platforms are several platforms, that have Spiked Balls being launched onto them, that lead to the Goal Pole. Star Medal 1: Floating above the Reversible Platforms next to the second set of Brick Blocks. Star Medal 2: On the platform next to two Spiked Ball generators. Star Medal 3: At the end of the elongated Reversible Platforms.